Recently we launched our premium LifeHack template. Today we are launching minimal version of LifeHack. 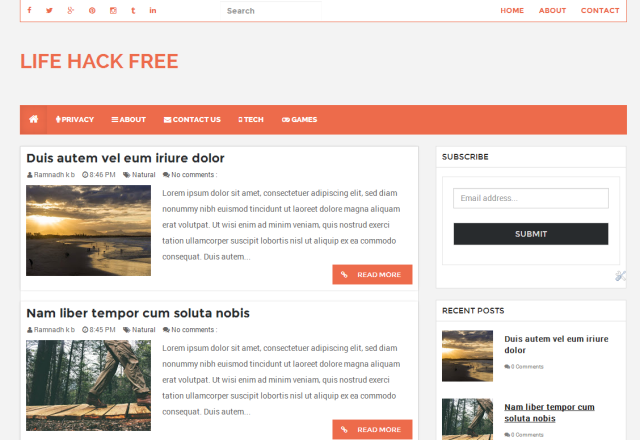 It is a free responsive blogger template with plenty of features. Best suited for creating tech blogs, and personal blogs. HTML Widget code just replace weblogtemplates with your feedburner handle. Thanks for using our template. Add your comment for support and other issues. tampilannya rusak di Internet Explorer 11. Please tell me how can i change number of post showing on my homepage..I want to show more then 3 post.. Exact search may not work . Please search for this code and <data:post.body/> try finding other code. Im Getting an error on mobile view that is im getting "Popular Content" line display below the Title of the domain and its works fine on PC.. In template Code Line 3920 i Found this Code.. The pager in this template is much better that in some of the others. I was wondering if there is a way to adapt it to say WeblogMag. I understand... but... pages for individual posts in WeblogMag already use the default page see throughout Life Hack. If WeblogMag was coded in a logical manner, it should be simply a matter of commenting out and if/then sequence to have the main page default to the same page as post pages. Should be a simple change, but have not been able to find that decision gate in the template code. Comments are not working - no comment button for readers and no comments being shown. Please help?